The two slit trenches laid isolated next to a dirt trail, a few hundred yards into a deep pine forest. 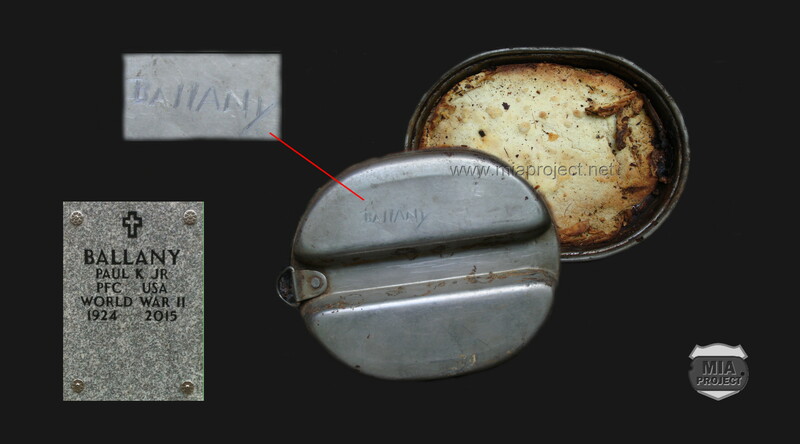 One of them released its long hidden war memorabilia in the form of two complete stainless steel mess kits and a couple of rusted K ration cans. One of the mess kits was heavier than its sister and obviously contained something. There was also a name crudely scratched on the cover. It read « Ballany ». Undoubtedly the name of the former owner. The surprise laid inside. The mess kit was filled with a meal, rather well preserved though not identifiable. A search for Ballany was initiated. The name was not as frequent as we had previously expected. After some research, there was only one individual matching with the place of the discovery and the different units who saw action in that general area. His name was Paul K. Ballany, Jr.
Paul Jr was born on November 17, 1924 to Paul and Anna Ballany, both Hungarian immigrants living in St. Louis, Missouri. When Paul received his draft notice, he went to artillery basic training and later joined the 630th Tank Destroyer Battalion. When the unit was sent overseas, it was attached to the 28th Infantry Division, a Pennsylvania National Guard unit that will write its History with bloody letters. « … During day patrols were sent east to German border and at night road blocks and outposts were manned. During night, probably around 2130, an outpost of the first Reconnaissance Platoon was captured. Five men were taken prisoner and 1/4 ton vehicle set on fire by Germans. Prisoners were apparently taken down draw East … ». These five men were the only reported losses for the day and we can assume that Paul was among the five men taken by the Germans. Was he captured while preparing his evening meal? The question will remain unanswered. Paul Ballany spent 242 days in captivity in Stalag 7A in Moosburg, Bavaria, Germany. From his Hungarian origins, he spoke German fluently and was used as interpreter. After discharge, he married Kathryn in 1946, raised a family and had one daughter and one son. Paul Kenneth Ballany passed away on June 08, 2015 in Little Rock, Arkansas at age 90.